Welcome to the all new holysoldier.com! In celebration of the 2005 & 2006 Holy Soldier reunion shows, we thought it would be a great idea to overhaul and update holysoldier.com with new information, new mp3’s, new photos, more old photos and more things that were not available to you before. After witnessing the success of Arthur Adam’s holysoldierfan.com, we became inspired to get holysoldier.com updated. This site was designed by Cleber Gossi of Gossi Design in Sao Paulo, Brazil. Cleber is an amazing web developer and a good friend who has worked in the past with Andy Robbins on andyrobbins.com and he also designed a site one of Andy and Michael Cutting’s side project’s In the Flesh – Tribute to Pink Floyd. at www.inthefleshtribute.com. We truly hope that you will enjoy the new and improved holysoldier.com! We always welcome your comments and suggestions at holysoldier@cox.net. Thanks for the support and God bless you! 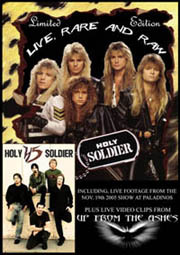 Here is the info you have been waiting for, the release of the Holy Soldier DVD, Live, Rare and Raw! It has been quite a long process but the final product is finished and very entertaining! We hope everyone loves it! The footage was compiled by each band member going back into our own personal achieves and reviewing years of VHS and professionally quality footage of live shows, record pre-productions, rehearsals, tour footage, interviews and more! In the end it was worth the effort we have digitally archived moments in our career we never want to forget and put it all together to share with you! Highlights include for the first time ever, releases of the videos See No Evil and Last Train. Bonus features include footage of Neon Cross, Ultimatum and Tyykus at last year’s Up from the Ashes festival. See our online store for ordering information. Christian hard rock/metal legends Holy Soldier will hit the road this April for a run of dates in major cities throughout Florida. 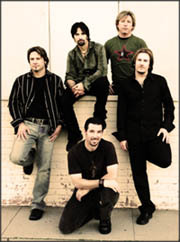 Holy Soldier, who has secured their position as one of the most identifiable Hard Rock bands in Christian music history, recently reunited after a brief hiatus in 2005 to perform special west coast performances with their original line up. This same original line up released their Dove Award winning self titled Holy Soldier album in 1990. The band later released two more critically acclaimed and best selling studio releases; the Dove Award nominated album Last Train in 1992 the Dove Award winning album Promise Man in 1996. In 1998 the released their farewell / live / greatest hits album Encore. The tour will start on April 19 in Jacksonville, and then moves on to in Clearwater on April 22nd then Fort Lauderdale on April 23rd, and wrapping up on April 24 in Pensacola. We hope that you had a wonderful New Year and holiday season! As 2007 is officially underway the band looks forward to bringing you more opportunities to hear them and see them live. Be sure to check the TOUR DATES section of this site in the next weeks for 2007 tour dates that will be announced! Holy Soldier releases and other Holy Soldier products are now available in Brazil! That’s right, our friends in Brazil and all of Latin America can now order products direct from Silent Music (www.silentmusic.com.br). Silent Music will carry only select items, so please check with them for product availability and pricing..
Holy Soldier has signed on Eduardo Bonadia of Strike Management for their representation in South America. Eduardo brings Holy Soldier years of experience in management, booking and publicity and Eduardo is also the editor of Strike Magazine. (www.strikemet.com ).